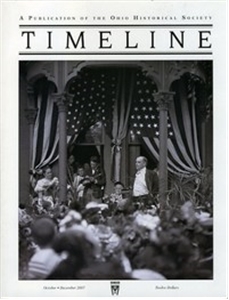 Published by the Ohio Historical Society, TIMELINE is a lavishly illustrated magazine that embraces the fields of history, archaeology, and natural history. Each issue features lively, authoritative, and well-illustrated articles, photo essays, and occasional reviews and special features. Since its inception in 1984, TIMELINE has received numerous local, state, and national awards. "I WISH MARK WAS HERE"